I’m here to tell you that we need to make pumpkin cobbler a THING. For some of you, it might already be a thing. I didn’t even know it was a thing until I decided I wanted to make it a thing and then it ended up already being a thing. And now it’s one of my things! It’s okay, you can punch me now. This is how this baby is made! Odd, right? I had to show you a pic so you actually believed me when you read the instructions down below. Because it TASTES LIKE HEAVEN. 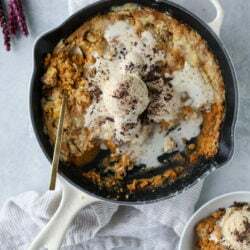 My initial thought with this recipe is that it would be like the chocolate skillet cobbler, but with pumpkin! It sounded SO delicious to me. And while it is a similar concept to that, it’s also almost like one of those old-school dump cakes where you pour the cake mix over top! What an unfortunate name though, right? Whomp whomp. Here’s the thing: the texture probably isn’t for everyone. It is like a cobbler-y cake but there isn’t very much crunch. It’s warm and soft and wonderful though. And topped with ice cream? OH MY GOSH. I want to eat it alllllll. The base is a pumpkin custard-like base and then I made my own “cake mix” (dry ingredients only!) and sprinkled them over top. It’s such a cool dessert and definitely one you can make ahead of time, but in doing that, I’d be sure to reheat it so you get the melty ice cream factor. And while we’re on the subject of ice cream, I really think this chai ice cream would be ideal with it. SO so so fantastic. Oh and a little chopped dark chocolate! For the chocolate factor. Like who isn’t into the chocolate factor? I have ONE more pumpkin-like dessert for you coming this weekend and it DOES involve chocolate, so of course you can take your pick. Sometimes I’m into chocolate and pumpkin and sometimes I just want one or the other. Or all the time I want both. Always. Preheat the oven to 350 degrees F. Have a 10-inch oven-safe skillet ready. In a large bowl, whisk together the brown sugar and eggs until smooth. Stir in the pumpkin puree, milk, pie spice, salt and vanilla extract until smooth. Pour the mixture in a 10-inch oven-safe skillet. In a small bowl, whisk together the flour, sugar, baking powder and salt. This is your homemade “cake mix” topping! Sprinkle it evenly over the pumpkin mixture. Drizzle the melted butter over top. Bake the cobbler for 55 to 60 minutes, until the topping is slightly golden and set. Remove the skillet and let it sit and cool for at least 30 minutes – this dessert needs 30 minutes to “set”! Otherwise, it will be somewhat gooey inside. Serve with ice cream, a sprinkle of cinnamon or pie spice and chopped chocolate. Note: the texture of this cobbler is much like this chocolate cobbler and NOT fruit cobbler. It’s almost like a gooey pumpkin brownie or cake with a semi-crunchy cake topping. 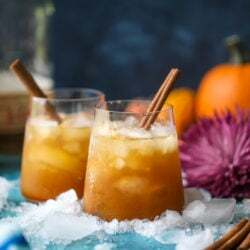 I have never heard of pumpkin cobbler but I’m totally sold! I think I am going to make this my contribution to our family’s Thanksgiving dessert table! I love how easy it is! Wow, this definitely looks absolutely incredible! Best part is, I already have most of the ingredients in my home! I’m really keen on how this recipe comes together — quasi-pumpkin custard topped with shatter-y cake dough — and want to try it, but baking anything other than bread-like substances in cast iron is generally a no-go for me. Any reason this wouldn’t work in something else? Would you recommend ceramic or steel? To replicate the cooking time of cast iron and create the right texture, should I pre-heat the vessel? Stick a pizza stone or brick underneath while cooking? i think you could definitely do it in a baking dish without any other modifications! i’d probably use a ceramic dish and cook for the same amount of time. This looks like the dessert of my dreams! Do you think adding oatmeal to this would be good? I feel like it would give it just a bit more texture…definitely trying this, yum!! for some reason i don’t think oatmeal would be that great on this… when i think oatmeal i think of crisps and crumbles and this is really different from that? but i didn’t mean to freak you out about the texture! it’s more like a cake than anything? Definitely have to make this! Omg! I’m definitely on board with this. I think you may be right about the texture and lack of crunch. I think I will try a slight modification and make a pumpkin crisp/strudel with oats and nuts for the top. Thanks for a great idea. let me know if you try it beth! thanks! Oh, I am loving this. Made this two times over the holidays. Everybody loved it. Even said it was better than regular pumpkin pie! So simple and delicious, I’ve made it twice with whole wheat flour. I would put your poster on my wall, Hanson style.